The families of this study lived in a region of Norway about 80 miles north of Oslo called Valdris, specifically in the Township of North Aurdal, State of Oppland. 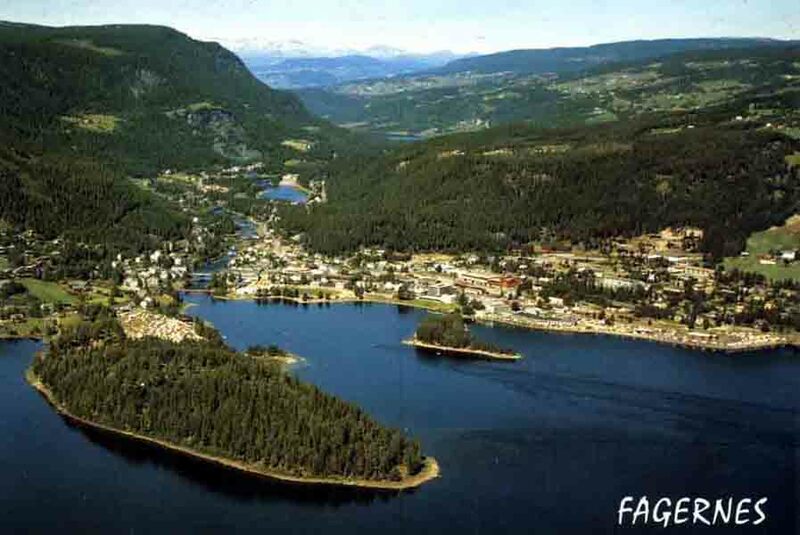 Fagernes is currently the central town of the area, however, it was not founded until the mid-1800's. In 1801 the two largest cities in Norway were Bergen (17,000 people) and Oslo (less than 11,000). In 1900, the total Valdres population was 17,000. The population in Valdres grew from 4,030 in 1645 to 20,551 in 1865 when the families emigrated. 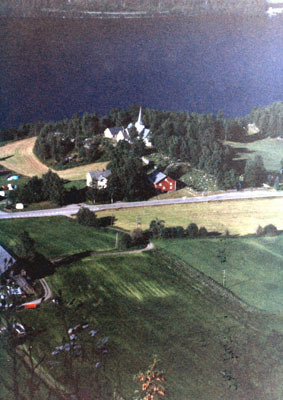 The following pictures of Fagernes, and the subsequent pictures of the family farms, were taken by Paul Johnson, grandson of Ole Johnson, on his trip to that area in 1997. 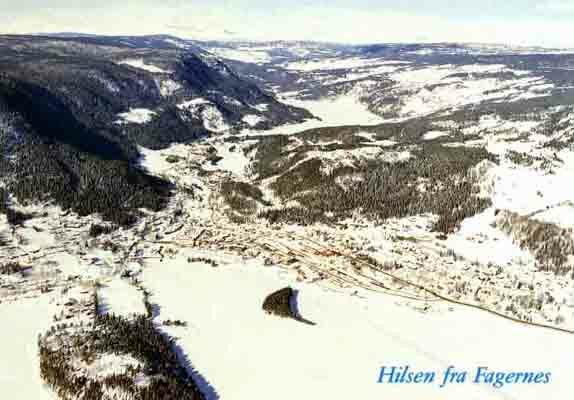 In the pictures below of Fagernes (summer and winter), the Sigrid Berg (wife of Sven) family farms: Osetbergene Farm and Bergo Farm, are on the hillside to the back and left of the picture. They are the small patches of cleared area among the trees. 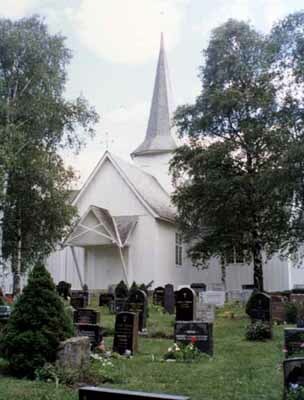 Norway has a State Church and the ecclesiastical subdivisions are similar to the administrative districts. As a result, North Aurdal is also the regional parish. Congregations developed within each parish dependent upon the ease or difficulity of communication as determined by the natural barriers of the settlement. The four congregations in the parish of North Aurdal are Skrautvaal, Ulnes, Svenes, and Aurdal (which was the congregation where the pastor resided). 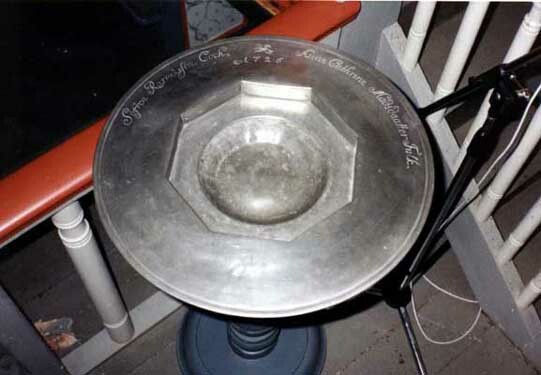 Family records for Sven and Sigri are in the Svenes and North Aurdal churches. In 1900 the population for each was: Skrautvaal 938, Ulnes 782, Svenes 962, and Aurdal 1794. In the early 1800's, Valdres was mostly a barter economy in which almost all consumer goods were produced on individual farms. This began to change as cities developed in the late 1800's. A rapid increase in population throughout the first half of the century was mostly responsible for emigration to America. Farms were subdivided for each generation until they were too small for adequate food supply. This, plus the fact that Valdres had frequent crop failures due to it's high elevation and the northern latitude, made life difficult. Some of these crop failures were documented as follows: "In 1812 Valdris had the poorest crop recorded. The grain froze early in the summer and people ate a meal of moss and the bark of the burch, elm, and willow; In 1817 crops froze causing great hardship; In 1860 there was almost continuous rain the entire summer so the grain did not ripen and rotted in the fields. The Begna overflowed its banks flooding the fields." To make the best use of the available land, the small farms in the valley had outfarms higher in the mountains to which livestock such as cows, sheep, goats, etc. would be taken for summer grazing, while the land at the home farm was used for growing crops and hay. Every spring the whole family was involved in moving the livestock to the outfarm. The animals were hearded or carried in carts when possible. Once settled in the new environment, the working men would leave the women and children to care for the animals and return to the main farm to tend to the grain crops. Several reasons have been suggsted for the rapid growth in population that developed in the early 1800's. People were living longer due to improved nutrition (potatoes were introduced as a food source) and vaccination along with improved sanitation increased life expectancy. Norway had benefited from 400 years of political stability aligned with Denmark until the Napoleonic Wars from 1808 - 1814. At that time, Denmark was at war with England and Sweden siding with France and Napoleon. In the peace treaty of January 1814, Denmark was forced to cede Norway to Sweden. During these war years, the English blockaded the Norwegian harbors preventing shipments of grain from entering Denmark. The law of supply and demand resulted in high inflation. This, along with ocassional crop failures, caused considerable hardship. Records show that there have been two main periods of migration from Norway. The first was at the time the Vikings were colonizing the world. This resulted in lessening the pressure of a growing population. The Black Death occurred about 1350 and also depopulated entire areas. By the late 1700's, however, large families were begetting larger families to severely tax the ability of Norway to feed itself. The first to leave in the 1840's maintained communication with their families as best they could and slowly painted a picture of America that opened the doors to mass migration. The political climate in Norway at that time did not resist the freedom of movement required for migration. This was an improtant factor because under societies governed by a king, the masses are usually considered property of the king and therefore, would not be free to emigrate. However,ded a boat at Detroit to cross Lake Huron and sail down Lake Michigan to Milwaukee or one of the other ports. They then found their way by rail road to Concil Bluffs, Iowa and crossed the Missouri river by ferry to Omaha where they were met by brother John. They were 9 weeks on the water and another 7 weeks to Stanton. For more information on Valdres refer to: "The Valdris Book" A Manual of the Valdris Samband by Andrew A. Veblen, Minneapolis, Published by the author, 1920. Johannes Mikkelsen (John Johnson's father) bought his father's farm (Espelihougen of Midstrand Vestre Inr. 214) October 28, 1836. It's location is Midstrand Vestre, Nord-Aurdal, Oppland. Johannes Mikkelsen sold the farm July 8, 1852 to his son Johannes Johannesen (John Johnson). Before John emigrated in 1866, he sold the farm to his mother, Marit Svendsdtr. She later sold the farm in 1873 and also emigrated to Stanton County, Nebraska with her son Ole and daughter Ragnild. Although Johannes Mikkelsen was listed as owner of Espelihougen, he and his family were living on another farm, Oydgarden No. 75,1 and 72,32 according to the 1865 census. It is interesting to note that this farm was owned by Iver Engebretsen who later became Sven's father-in-law. 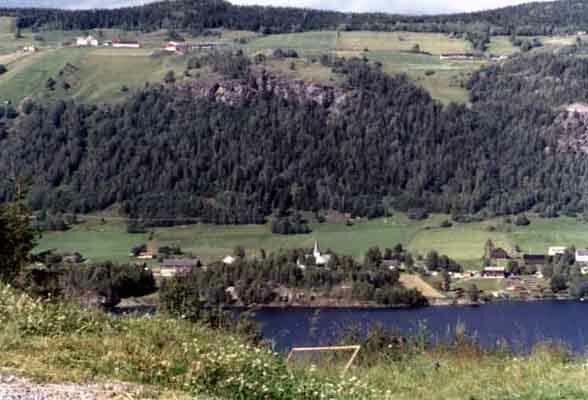 The pictures below show a view looking at the Haugen and Oydegarden farms across Strondafaorden lake from the Svenes Church on the Fagernes side. The farms are directly across from the Church, The Haugen farm starts at the lake and is about 75 acres in size. The name "Haugen" means dweller on the hill in Norwegian. In Norwegian, Oyde means to desert, to leave from. Oy was added to the Oygarden name at the time of the bubonic plague because the people then living on the farm departed from it due to their contacting the plague. 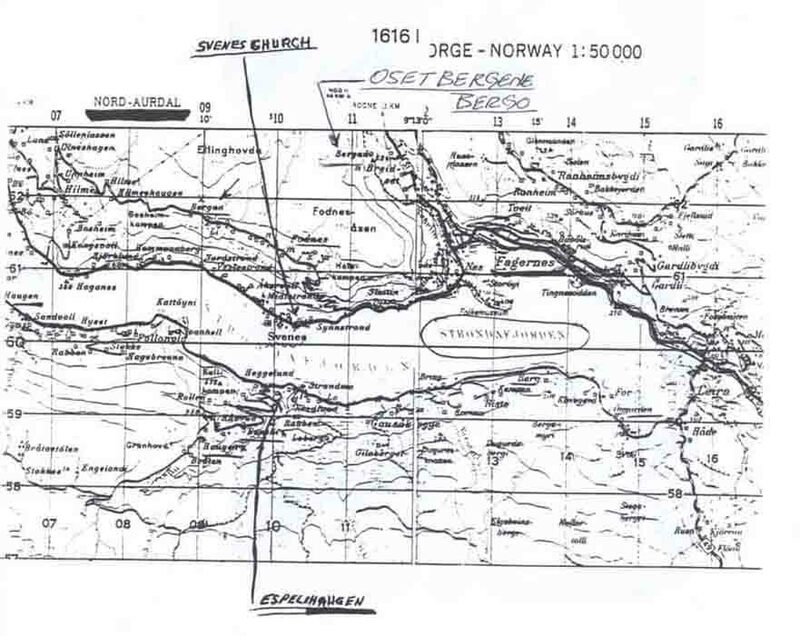 the following is a map showing the location of the farms, Haugen, Oydegarden, and Bergo relative to Fagernes and the Svenes Church. The picture below shows the Svenes Church across the lake taken from the hill side of the Oydegarden farm. The picture below left shows the Svenes Church taken from the hill behind it. The picture to the right shows the Church and graveyard. 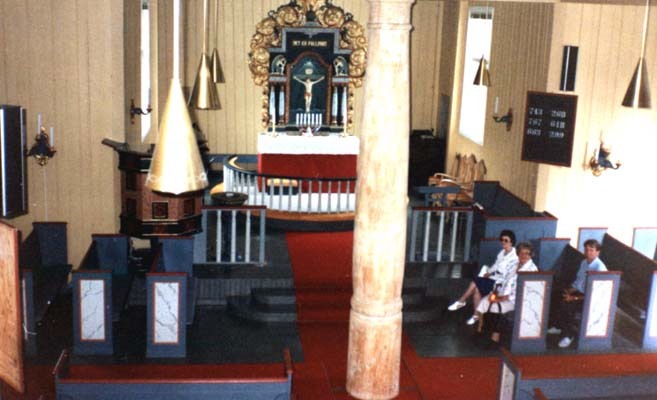 This is a picture taken inside the Svenes Church. The Church was built in 1735. It was moved in 1859 from Svenes property to Strond property where it is currently located. The center support column was made with the help of Sven Johannesen Haugen (Sven Johnson). Seated are Loretta Johnson, Gudrun Kullhuset and Son Sigbjorn. 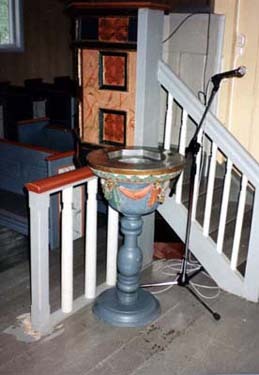 The pictures below show the baptismal font donated to the Svenes Church in 1725. The history for the family of Sven's second wife (Sigrid) is as follows. Sigri's maternal grandfather Syver Syverson bought 5 ksk land Oydgarden Midstrand from Syver Halvorsen for 500 speciedaler February 24, 1826. Iver Engebretsen and Ragnild Syversdatter (Sigri's parents) inherited the farm February 17, 1847. They later sold the farm to their oldest son, Syver Iversen, for 200 speciedaler April 18, 1873. This farm is currently identified as Oydgarden No. 75,1 and 72,32. This was the farm Johannes Johannesen was living on in 1865. Iver Engebretsen and Ragnild Syversdtr (Sven's in-laws) also owned a farm called Fodnes Mellem (old numbers 185c, 187, 184d) in 1865. This farm was later sold to their second oldest son Engebret Iverson recorded in 1886. This farm is currently called Bergo or Breiset og Hermanstaolen No. 68,3. 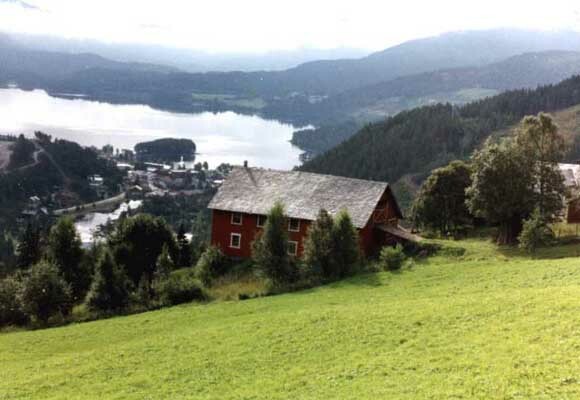 The picture below shows the Bergo farm taken from Fagernes. 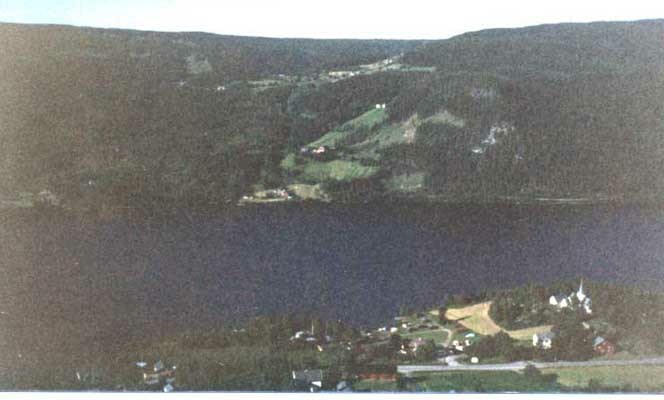 The picture below shows Fagernes taken from the Bergo farm. In 1866 only sailing ships were available for passage to America. These ships left in the spring to return in the fall for one round trip per year. The passenger fare was 13 speciedaler. To be in Bergen for the departure, they had to plan enough time to travel to Laerdalsoren and then go by boat to Bergen. Supplies for the voyage and everything necessary for starting a new life in America had to be transported. Johannes Johannesen Haugen (John Johnson) his wife Margarit (Mary) and children Johan (John) and Tulline (Lena) Haugen sailed from Bergen aboard the Gustave Adolphe on May 14, 1866. They arrived in Quebec on June 16. They continued to Iowa by barge and railroad where they worked for a year before traveling to Stanton County, Nebraska. Sven Johannesen Haugen (Sven Johnson) his wife Sigri and children Joran (Julia) and Johannesen (John) sailed from Bergen aboard the Claus Heftig on April 23, 1868. They arrived at Quebec City on June 14. They continued by barge and rail road to Concil Bluffs, Iowa and crossed the Missouri river to Omaha where they were met by brother John. Siri married Halver Halversen in Valdres in 1866 and emigrated in 1868 at the same time as Sven. 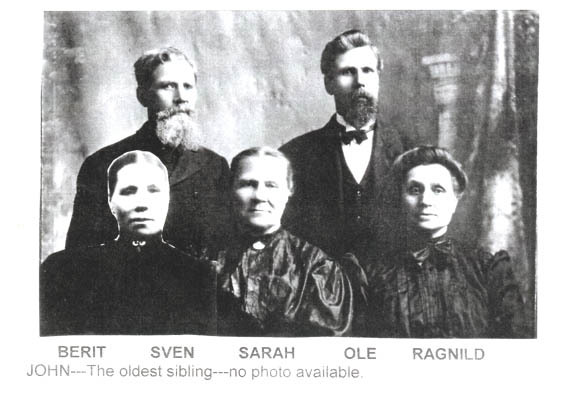 In 1873, Marit Svendsdtr (Mary Johnson) sold the farm and cane to America with her youngest son Ole and daughter Ragnild. By this time, all of the family except Agathe and Berit had emigrated. Sigri's father, Iver Engebretsen, sold the farm Oydgarden to his oldest son Syver, April 18, 1873. At the same time, he sold the farm Bergene (previously called Fodnes Mellem) to his second oldest son Engebret Iversen. Neither Syver nor Engebret immigrated. However, at least some of their children did. Iver Berg immigrated in May, 1873 and arrived Wisner, Nebraska July 1, 1873. In 1874 he homesteaded in Boone County and in 1875 he married Ellen Fodnes. Helge (Henry) Berg immigrated in 1873 with his older brother, Iver. About 1875 he homesteaded in Boone County. Later he married Ragnild Knudson. Marit immigrated May 7, 1874. Niles Berg immigrated in 1880. He attended Luther College and Luther Seminary being ordained in 1895. In 1900 he married Jennie A. Woldstat. m. 1873 Ole O. Loe (1825 – before 1902) his second marriage ?